Jen Floyd, aka J-flo, aka the Own Your Eating “Macro Mama”, has just given birth to her third baby and she had a GIRL!!! Finally she’s no longer completely outnumbered in her household. Born on September 16th, and weighing 8lb. 2 oz. Mom and baby girl Daphne Grace are both doing amazing! 😍 We are so thrilled for her and the Floyd household. Before J-flo finally popped, we asked her a few questions about her experience with tracking macros during her third pregnancy. Pregnancy can be tough on your body. Get the low down on why maternity macros and postpartum nutrition is healthy for you & your baby! 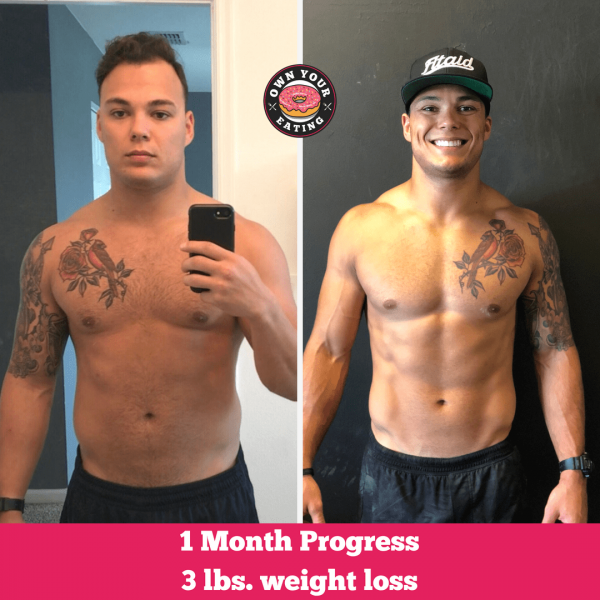 We recently introduced you to Joe Thiede from Train Harder CrossFit who has made a huge comeback with his health and fitness by easily implementing the Own Your Eating lifestyle. Well you know what they say about successful men? They have incredibly supportive and successful wives! 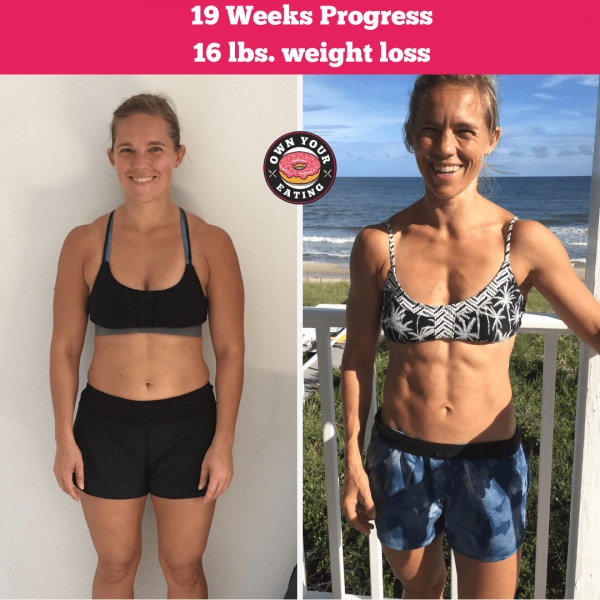 OK maybe that’s not how the saying goes, but in this case it’s most definitely true.Introducing you to Alison Thiede, co-owner of CrossFit Train Harder and our phenomenally successful transformation feature this week. 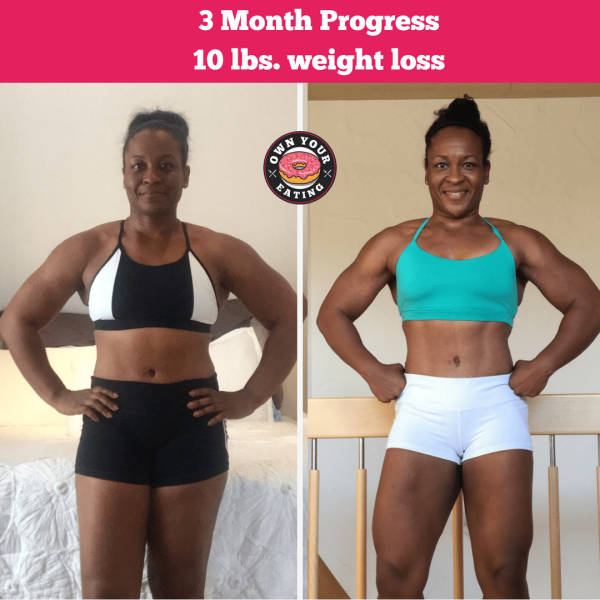 Read on to find out more about her experience with Own Your Eating. Owning a gym seems like a great way to stay in shape right? I mean you’re in the ideal environment 24/7 so how can there be any excuses to not looking “the part”? Joe – and like many other gym owners out there – didn’t find this to be the case. 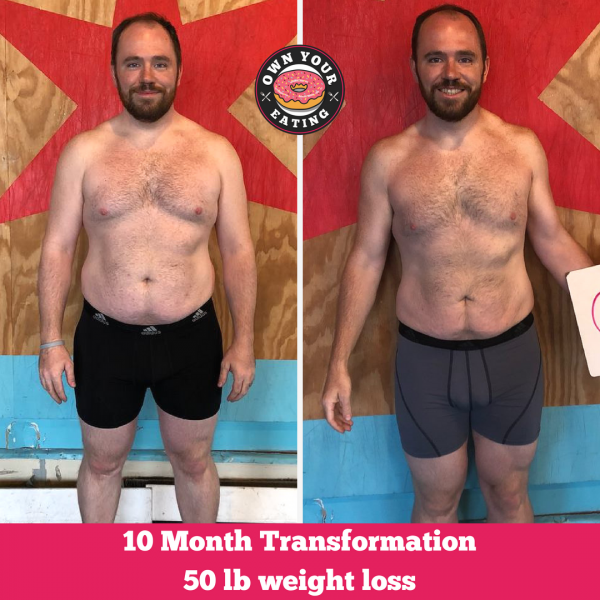 As he focused on growing his business, Train Harder CrossFit, his fitness and physique declined. Whether you’re a gym owner or not, we’re sure you’ll resonate with Joe’s story of how other demands in life took priority over his own well-being. Read on to find out what Joe did when he finally reached his breaking point. In episode 43 of the Own Your Eating Podcast, Jason caught up with one of our clients, Sarah. Her self-proclaimed nickname “The Lifting Flutist” honors her life’s passions of lifting and playing the flute – she’s actually a professional concert flutist! Sarah is also a single mom, in the military and is here to share her transformation story and let you know that YOU CAN DO IT! Who is Jason Ackerman? You can find out more about what makes Jason tick by checking out his story on our website. Vince is the man!…firefighter, coach, and really just an all around great guy. 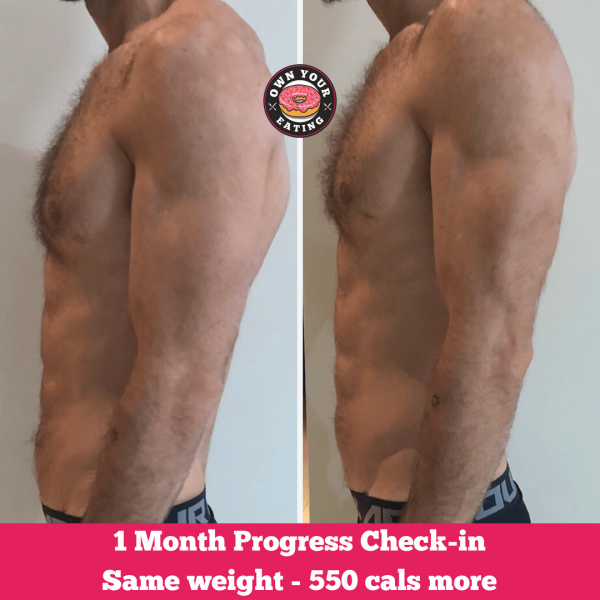 We drove 6 hours to his CrossFit L1 a few weeks ago and we chatted about everything from past relationships to our goals in life…somewhere in those deep conversations we talked nutrition. 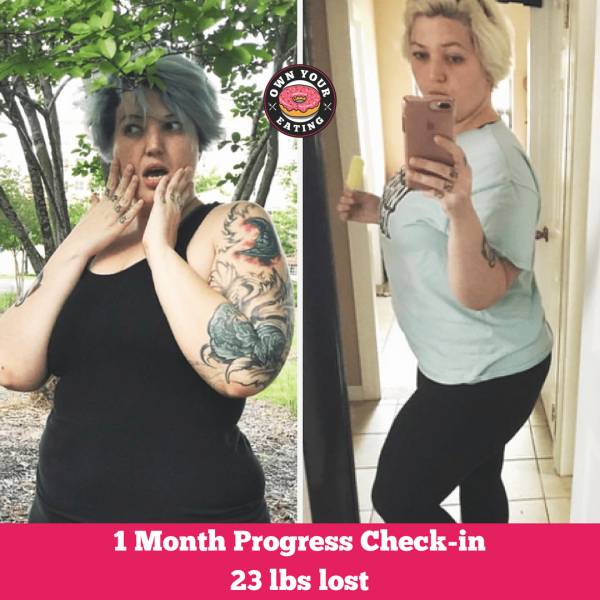 Candice got started with Own Your Eating back in May 2018. Like a lot of us, the only time in her life she was able to maintain a healthy weight was when she was practically starving herself. Well this time Candice’s weight loss is completely different! Candice is satisfied with the amount of food she’s eating and she’s not having to deprive herself of the food she enjoys! We love to see people reaching their weight loss goals but we are always so thrilled when we help people change their relationship and mindset in respect to food. Congrats to Candice for taking the plunge & trusting us to help her overcome her difficulties with weight loss. Gaining weight is harder than most people think! 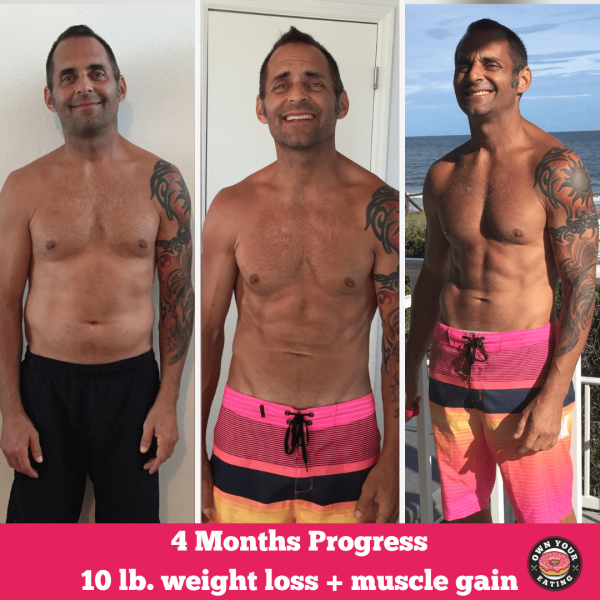 Jason Gordon has made an amazing transformation in the last 4 years and just like many women out there, he has a very real fear of gaining weight again. Contrary to popular belief, women aren’t the only ones who struggle with the number on the scale. Even when you want to make strength gains, eating more food and seeing that number on the scale increase is a real mental challenge. We met Noah at Goose Island CrossFit in Chicago when we were on our seminar tour last year and en route to the Games! Noah is one of the MOST hospitable people we’ve ever met – which means a lot given our traveling history! It still makes my heart smile when I think about the incredibly warm welcome we were given. Aside from being a stand-up person in his community, Noah is the owner and head coach at Goose Island CrossFit. Not everyone wants to lose weight and the truth is, a lot of the time our clients don’t need to. Want they want is a change in body composition. Adam was going to CrossFit but his body had stopped changing. Why? Because you can’t out train a bad diet! Nutrition is the foundation of our health, fitness and physique. 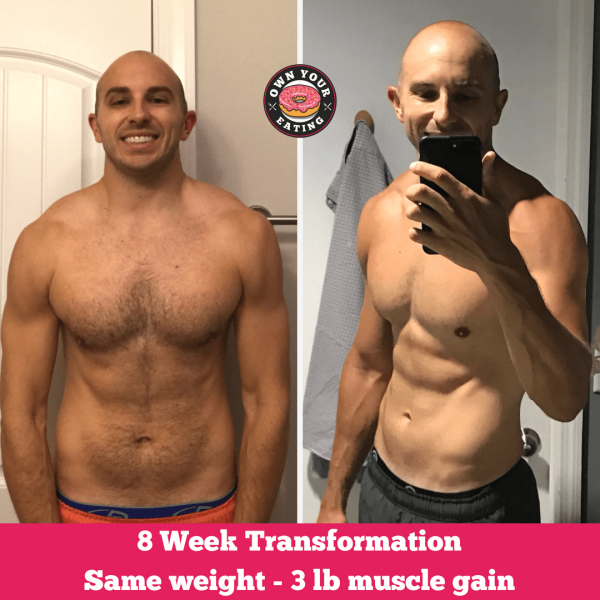 And that’s why with our help, Adam was able to completely change his body in just 8 weeks! 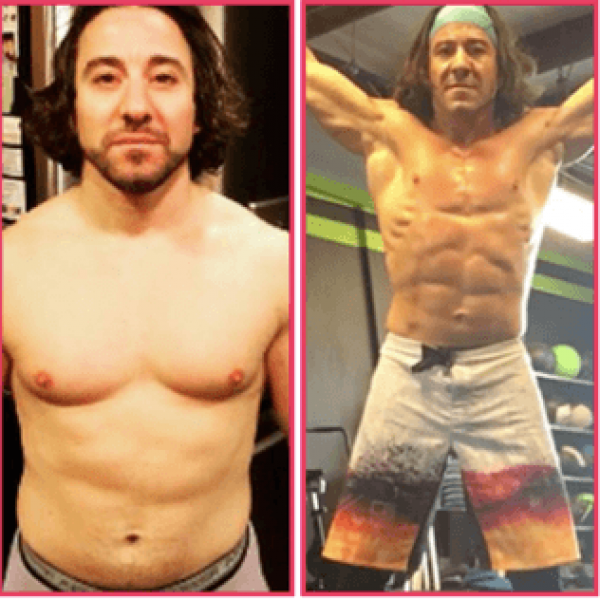 Check out his amazing transformation!